I’m all for healthy discontent. I think it’s helpful for us to think through and rethink through ideas. It’s often how innovation happens. It’s often how creativity happens. But there’s a real difference in being someone who is seeking to bring about positive change in a situation and being someone who is a curmudgeon. Let me explain with an example from literature. 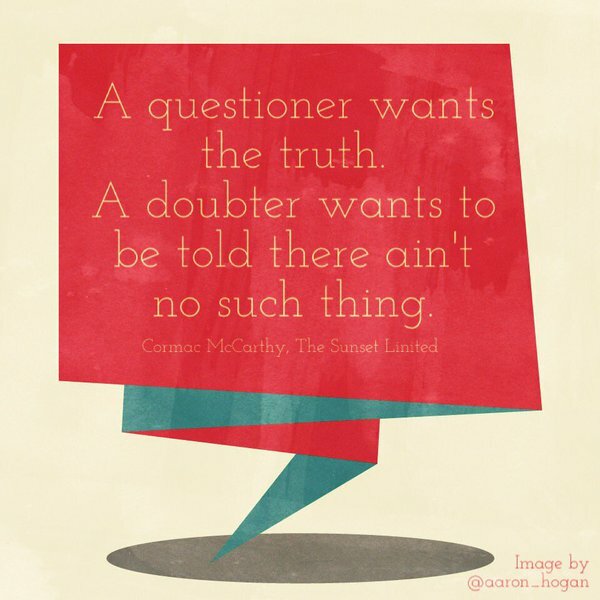 I love that distinction–that the questioner wants the truth. That’s so important to the way we approach problems, the way we try to resolve issues, the ways we try to move progress forward. But it’s something we miss so often, even with the best of intentions. We can’t have the hard work of many undone by a few dissenting doubters, and it’s our job as leaders (regardless of title) to help push people to become deeper questioners and infrequent doubters. Here’s a few ways we can make sure we’re on the right side of this distinction. A questioner is driven by wonder, but a doubter is blinded by limits. Ask more questions. Think about what could be. Consider that biggest limit–the one that everyone knows about, the one that everyone thinks can’t change, the one that everyone believes is holding them back. Ask people what they would do if that obstacle were removed. Ask others to think up ways to creatively work inside the box while that road block persists. And ask others to commit to thinking of ways that you can see past the road block together. A questioner knows he does not know; a doubter assumes he knows what can be known. A doubter loves to try to paint questioners into a corner using a bunch of fast talking and quick questions (almost to the point that people begin to believe that this doubter may know something we all don’t know). More often than not, that doubter is stuck on the idea that we have to have things–all things… every last little thing–figured out before moving forward. This can happen so much so that the doubter feels petrified of moving forward without total, 100% certainty of the course of action and destination deviating from the current path will require. A questioner knows he does not know, and that sits okay with him. He’s pursuing a solution, thirsty for an answer; but that doesn’t cause him to dwell on the few gaps in current understanding. A questioner seeks greater understanding, while a doubter discounts what he cannot understand. A questioner genuinely wants to know and understand more, and at times, it’s not even for any purpose in particular. Many times, the questioner’s pursuit of new knowledge gives him a wide body of knowledge to which he can compare future solutions. It serves as a broad, varied sounding board for future ideas. As a questioner pursues the unknown, he embraces struggle and acknowledges his limits. A doubter’s faith is in himself. He fails to see the need to learn without a particular end in mind, and his perspective is closed not only by his attitude, but also by the shrunken scope of solutions that results from it. Beyond anything the questioner can do alone, each questioner I know believes that there is such great power in the collective. Those questioners know the value of sharing their learning, asking big questions, connecting to others, and listening carefully as others share likewise. They spend more time listening and less time talking, and yet those with whom they interact end up rejuvenated and energized after their interactions. So, take a few minutes before you click off to the rest of the internet and think about it. 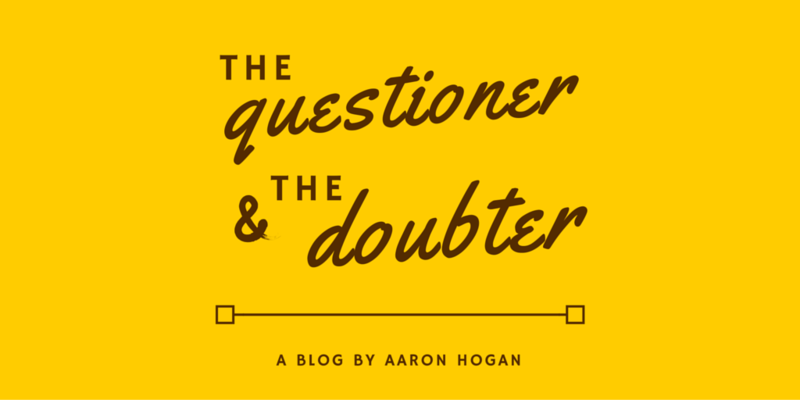 Are you a doubter or a questioner? How do you become more of what you want?